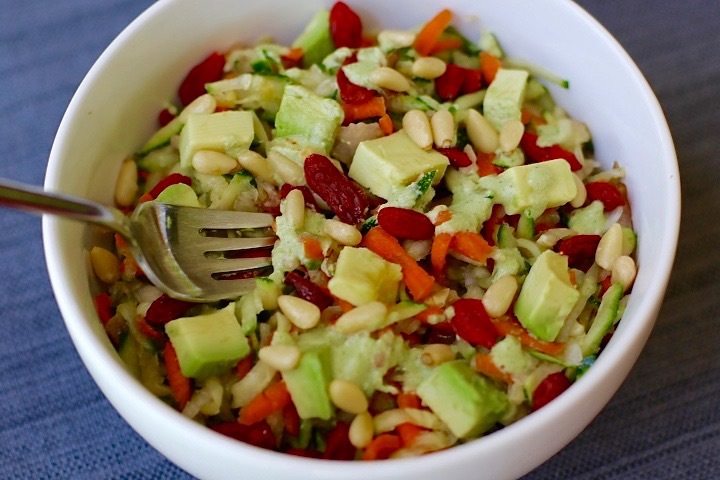 Summer is right around the corner and a refreshing salad is the way to go on a hot, sunny day. Flavourful and nutritious, this dish will satisfy your cravings and is a much better choice if you are trying to maintain a healthy weight. I am counting the seconds until school is out. My over-scheduled days will come to an end and I can focus a little more on this blog and training for my marathon in October. Sort of… I still have 4 kids and 6 cats to tend too! 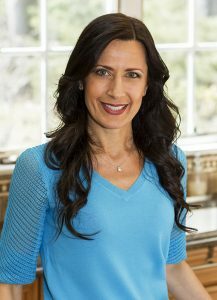 As busy as my days can be, I love creating healthy recipes for my family and now I can share them with you! I have a few toys in my kitchen that have helped me expand my culinary ideas. This salad is a perfect example. I recently purchased the XL2000 Vegetable Chopper so I would be able to get a bit creative especially when it came to a salad. When making this dish, I have only used a XL2000 Vegetable Chopper, but I think you will be able to shred the vegetables with a boxed grader as well. Using the stringer/medium grater blade for the XL2000 Vegetable Chopper helped me achieve the consistency and texture that really works perfectly together. 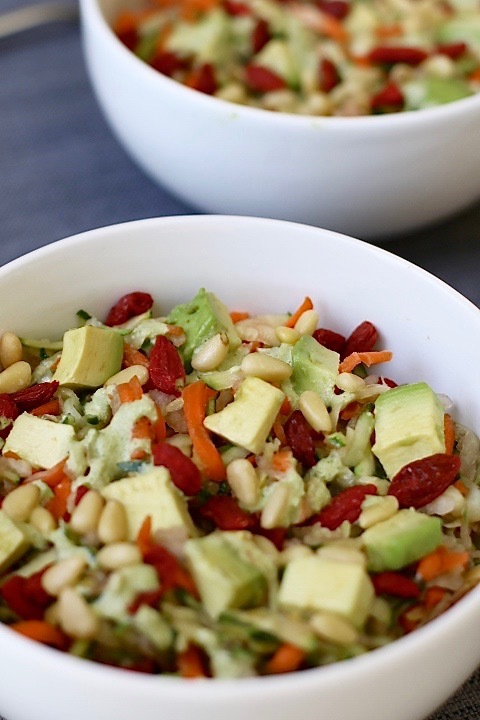 This salad also refrigerates well and continues to hold its crisp texture. Actually the overnight marination process enhances the flavour combination of the dish. The aromatic, pungent and spice of ginger is balanced out with the sweet taste of the asian pear along with the other ingredients making it a perfect medley. My post will not be complete if I do not give you a little background about at least one of my healthy ingredients. Ginger is the star of the show today! Ginger has long been related to effectively alleviating symptoms of gastrointestinal distress. But are you aware that ginger also contains anti-inflammatory properties, protects against cancer and has a broad-spectrum of antibacterial, antiviral, antioxidant, and anti-parasitic properties? Ginger is said to speed up your metabolism. With this increase in thermogenesis in your body suggests ginger may be useful in weight loss as well. This light, refreshing meal will be a great addition to you summer recipes. 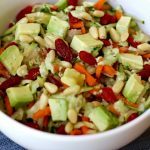 It is easy to make and can be pre-made and refrigerated for a few days for a quick, healthy meal. 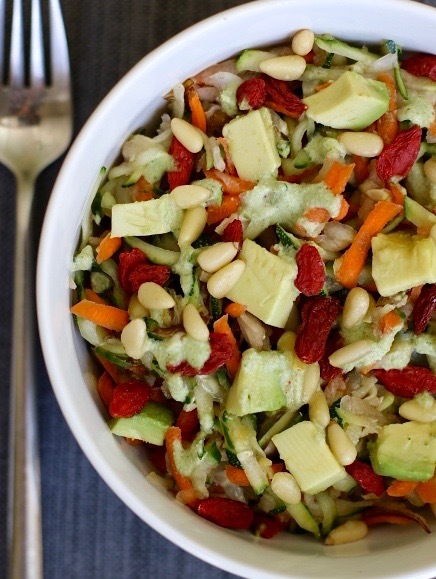 Light, refreshing and flavourful this salad is perfect for a warm summer day. Gluten-free, vegan and raw, the texture and consistency really works well together. With an amazing array of healthy ingredients it is definitely a great dish if you are watching your weight. 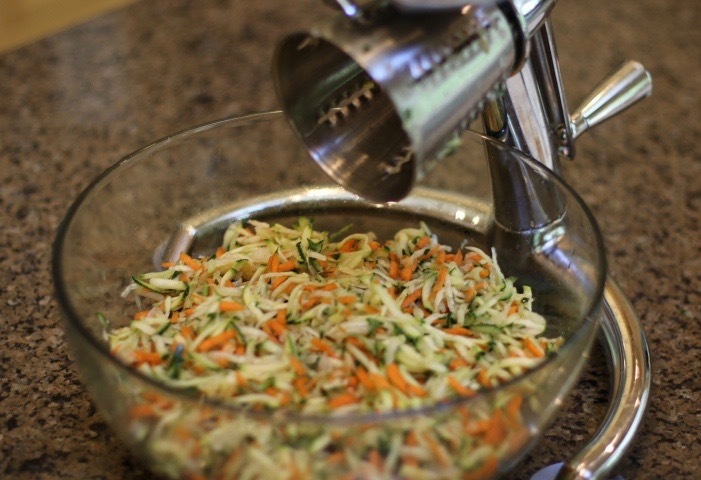 Use the stringer/medium grater blade of the XL2000 Vegetable Chopper and shred all the ingredients separately. I leave the skin on all the ingredients because it is rich in fiber and nutrients. Just cut the ends off the carrots, zucchini and cucumber. For the pear, cut it in quarters, take the core out and then place in shredder skin side down so the skin doesn't peel off. Then toss the ingredients so they are mixed together. Separate a portion into a bowl and add the dressing and the toppings. 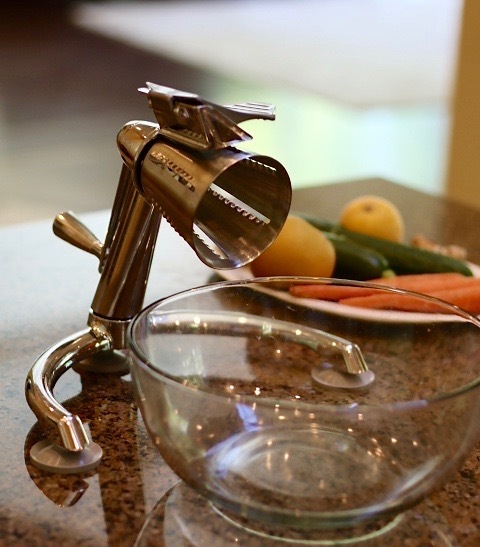 Do you own a vegetable shredder? So easy! Can’t wait to try it! Great! I am so happy to hear that. It looks delicious! I intend to try it this afternoon. Thanks for sharing another healthy dish! Thank you! So glad you will try it. I love avocados in my salad and I do like ginger. I used to eat a tuna salad a lot, but looking to try new options. I have a veggie shredder but yours looks more durable. 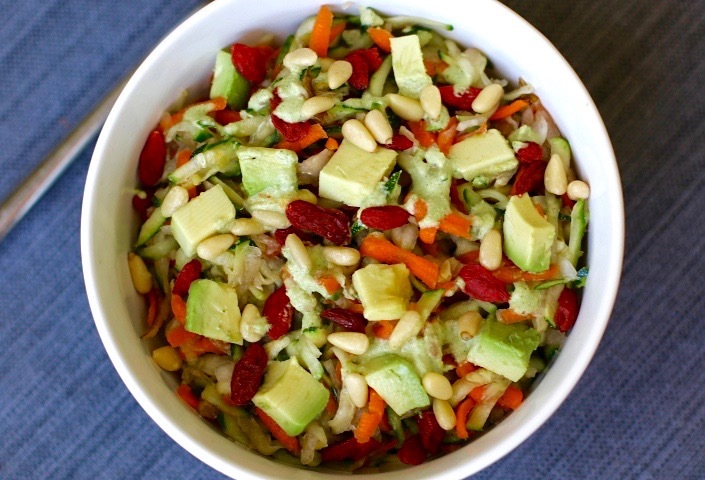 This salad looks perfect for the summer get togethers! You sound like you eat really healthy. That’s great! The salad is very refreshing. Thank you! I hope your back feels better. I love all the colors in the salad! I also love any salad with cilantro! Thank you! I love cilantro as well. Hi. Did you post the recipe for the cilantro dressing? I have a bunch of cilantro and looking for some options for it. As the ginger lover I am, this is the perfect healthy dish for me. The medicinal properties ginger has for the body and brain truly makes it one of my favorites!